Based on its material CSR issues (materiality), the Nabtesco Group has been promoting Group-wide efforts to reduce greenhouse gas emissions and to enforce energy-saving activities as part of its measures against climate change. In FY2012, we introduced the energy conservation activity commendation program to further strengthen our energy-saving activities. We have set Group-wide improvement themes, including the reduction of energy consumption in equipment operations, maintenance and management and other production activities, and strive to steadily reduce greenhouse gas emissions by monitoring the status and effects of such efforts in a quantitative manner. In addition, we have introduced an energy-saving product certification system to promote the development of energy-saving products, thereby contributing to reducing greenhouse gas emissions generated by our customers’ use of our products. In November 2016, the Paris Agreement*1, an international framework for countermeasures against climate change beyond 2020, came into effect and the 2 degrees Celsius target*2 was adopted as an international target. In response, the Nabtesco Group set a long-term target for reducing greenhouse gas emissions, which has been approved by the SBT (Science Based Targets)*3 Initiative. The Nabtesco Group also advocates the measures taken by the CDP*4 of the United Kingdom to mitigate the impact of climate change and reduce greenhouse gas emissions. In FY2010, we began to disclose the Nabtesco Group’s climate change strategies and greenhouse gas emissions to the CDP to enhance the transparency of our own efforts. In FY2017, CDP included us in the Climate A List and the Supplier Climate A List, which list the highest-rated companies. *3 A framework that encourages companies to set their medium-term targets (for five to 15 years ahead) at a level that will enable achievement of the 2°C target. Such targets are certified following a screening by the SBT initiative. *4 The CDP is an international non-profit organization. It urges companies that boast the world’s top-ranked total market value to disclose their climate change strategies and greenhouse gas emissions levels. Based on the information disclosed, the CDP annually evaluates the companies and announces their scores to the public. The CDP represents 803 institutional investors with total assets of 100 trillion US dollars (as of 2017 survey), and calls on Japan’s top 500 companies in terms of market capitalization (that is, the constituents of the FTSE Japan Index) to disclose information. 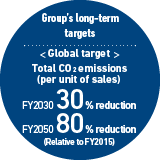 In FY2016, the Nabtesco Group set long-term greenhouse gas emissions targets for FY2050 with the aim of preventing global warming. 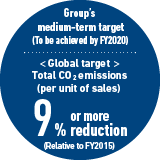 Specifically, we aim to reduce (1) CO2-equivalent emissions of greenhouse gases by our Group companies in Japan and (2) CO2 emissions relative to sales (per unit of sales) from our global production activities including emissions from our overseas sites, by 30% in FY2030 and by 80% in FY2050 compared to the FY2015 levels. Moreover, the long-term target for reducing greenhouse gas emissions from Nabtesco Corporation, which is included in (1) above, has been approved by the SBT Initiative. We have also set medium-term targets for FY2020. Specifically, we aim to reduce our total amount of CO2 emissions to a level below that of FY2015 and lower our emissions per unit of (global) sales by 9% or more, in light of the anticipated increase in production volumes and reinforcement of plants and equipment in line with our expected future operational growth. In addition to reducing our own emissions, we have begun to expand activities to our suppliers. Of the greenhouse gas emissions from our entire supply chain, the percentage of emissions from purchased goods and services (category 1 of Scope 3 emissions) is high, making it essential for our suppliers to take initiatives to reduce their greenhouse gas emissions. In response, we began a survey of our main suppliers (top suppliers who constitute 70% of the annual amount of purchases) to see whether they have set voluntary targets to reduce their greenhouse gas emissions. As of FY2017, 45.2% of our main suppliers have set voluntary targets to reduce their greenhouse gas emissions and begun to take initiatives to achieve the targets. We will provide support so that all of our main suppliers will set voluntary reduction targets by 2025. In FY2017, the total amount of CO2 emissions from our Japanese operations far exceeded the target level. 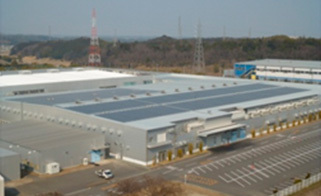 This is mainly attributed to the temporary effects of double operations of the facilities in the transfer process to the (two) plant buildings completed at the Gifu Plant (aircraft equipment business, in Japan) in order to respond to an increase in demand, in addition to an increase in production volume of precision reduction gear business. Also, in FY2017, we carried out the following major energy-saving activities. 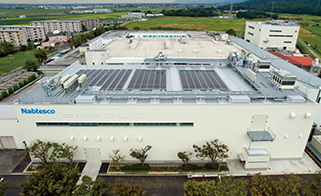 At the (two) plant buildings completed at the Gifu Plant we can reduce CO2 emissions by 50% compared to the previous level due to the adoption of the advanced environmental technologies. In addition, we carried out facility renewal by consolidating processing procedures that were conducted by multiple facilities into a single facility to improve the production capacity and energy efficiency. We also revamped processing facilities with inverters to save energy and replaced air-conditioning equipment and lighting equipment with highly efficient versions. Moreover, another new plant building is scheduled to be completed at the Plant in FY2018. Similarly, it is possible to reduce CO2 emissions by 50%. It can be expected to contribute to reducing CO2 emissions through operations of these new facilities by taking advantage of the advanced environmental technologies in the future. Our global emissions, which combines emissions from both Japanese and overseas sites, increased by 20% from the previous fiscal year, partly reflecting the commencement of operations of a plant in China in the precision reduction gear business as well as the rebound of the Chinese market for construction machinery in the hydraulic equipment business. In addition, our CO2 emissions per unit of sales for FY2017 exceeded the FY2017 target level by 7% on a global basis due to the above mentioned temporary factors. The Nabtesco Group has been advancing energy-saving activities toward achieving our long-term targets through the improvement of efficiency of production equipment and air-conditioning equipment and the utilization of energy monitoring systems. Although our production capacity is expected to continue to expand in line with operational growth in the future, it is a prerequisite that new plants to be established in Japan and overseas cut their energy consumption by 40% or more relative to that of existing plants. It is our plan to leverage energy-saving technologies to be developed at these new plants for use at our existing plants, thus achieving the reduction of CO2 emissions across the Group. *1 The calculation policy and standards comply with the Act on the Regional Use of Energy and the Act on the Promotion of Global Warming Countermeasures, and are aligned with the internal Guidelines on the Management of Environmental Information. *2 The management of the results for the total CO2 emissions is based on the number derived from the internal management index. The CO2 conversion factors used to calculate actual results are the FY2008 factors, except the factor for electricity, for which the default value of 0.555 kg-CO2/ kWh is used. *3 The calculation period covers January to December 2017. *4 The calculation scope includes Nabtesco Corporation and domestic Group Companies (9 companies and 25 sites), which are listed at “Scope of Environment and Other Data,”. *5 The CO2 conversion index published by the Ministry of the Environment for each industry is used as the actual emission factor. *6 The calculation scope includes Nabtesco Corporation, domestic Group companies (9 companies and 25 sites), and overseas Group companies (13 companies and 13 sites), which are listed at “Scope of Environment and Other Data,” . The Nabtesco Group began to calculate greenhouse gas emissions from the entire supply chain in FY2013 with a view to identifying and effectively reducing the environmental impact of our business activities as a whole. The following table shows the calculation results of past three years. The following table shows the breakdown of our Scope 3 CO2 emissions. Of our Scope 3 CO2 emissions, “Purchased goods and services” (category 1) accounts for the largest percentage of 83.2%, followed by “Upstream transportation and distribution” (category 4) at 8.8%. Our Scope 3 CO2 emissions decreased due mainly to the improved precision of CO2 emissions calculation, resulting from the revision of classification of purchased goods. At the Nabtesco Group, we will continue to identify and reduce greenhouse gas emissions from our entire supply chain. In order to ensure the reliability of the calculation results, we had them verified by a third party, Lloyd’s Register Quality Assurance Limited. *7 The calculation scope includes only domestic operations: Nabtesco Corporation and Group companies (9 companies and 25 sites), which are listed at “Scope of Environment and Other Data,” . *8 The calculation policy and standards comply with the Act on the Regional Use of Energy and the Act on the Promotion of Global Warming Countermeasures, and are aligned with the internal Guidelines on the Management of Environmental Information. *9 The calculation scope includes Nabtesco Corporation only. The Scope 3 calculations for FY2017 were made by the following method and for the following period and scope. The Nabtesco Group strives to reduce its energy consumption, targeting an annual 2% reduction in energy consumption per sales unit. We are continuously working to conserve energy and replace existing equipment with energy-saving alternatives. We have also installed electricity meters in our energy-heavy production facilities to monitor excessive use of electricity and standby power, repair equipment, and improve operational methods. We have also visualized our energy consumption by introducing a monitoring system, which permits us to monitor our energy consumption on a real-time basis. At the same time, by engaging in activities to raise our employees’ awareness of energy conservation, our global energy consumption per unit of sales has been in a declining trend. To raise awareness of energy conservation, we established the energy conservation activity commendation program in September 2012. Under this program, we commend sites that have made great achievements in energy-saving activities. 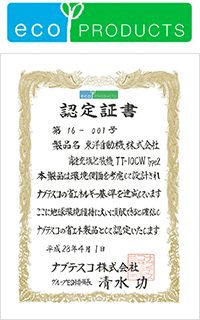 In FY2017, Railway Products Company (Kobe Plant) and Nabtesco Automotive Corporation (Yamagata Plant) received commendations under this program. 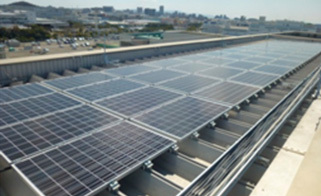 The Nabtesco Group is promoting the use of renewable energy equipment at its facilities. First introduced to the Tarui Plant (Japan) in 2012, solar power generation facilities began operating at the Tsu Plant and the Kobe Plant in 2016, and at the Gifu Plant and a precision reduction gear plant of a Group company in China in 2017. The Nabtesco Group will continue its proactive measures to promote the use of renewable energy in the future. This certification system was established to foster the design and the development of energy-saving products in order to promote environmental protection and the development of a sustainable society. Through this system we are contributing to the mitigation of global warming while increasing the environmental awareness of our employees. For products that have obtained the certification, we issue certificates, approve the use of the certification mark and make announcements about the certification in our in-house magazine. For energy-saving product certifications, we internally evaluate products to be released on the market to see whether they meet more than one certification criteria and exceed existing levels in non-requisite criteria items. In FY2017, the following products were certified as energy-saving products. One is the ECS-800-V Eco-Engine Control System from the Marine Control Systems Company. When developing this product, the company succeeded in the significant reduction of its weight by renewing the system structure. The other product is the SF-250-35 intelligent forming machine from TS Precision Inc., which features lighter weight and much lower power consumption than previous models. The Nabtesco Group collects important information about the environment, safety, accident prevention, health, and others, including climate change-related risks and opportunities, assesses the materiality of related issues, and discusses measures to implement for those that are deemed to be important. In FY2017, as a part of measures against climate change-related risks, we replaced air conditioners with energy efficient air conditioners, which have been increasing in response to the rising average temperature. We also carried out repair work to prevent rain leakage and performed maintenance on drain ditches as part of measures against torrential rain, which has been increasing. For these and other measures, we spent approximately 107.6 million yen in total. Furthermore, in FY2017, we spent about 8.7 billion yen on R&D related to climate change measures, development of green products, and other initiatives. The Nabtesco Group owns motion control technologies, which are used to control movements of a variety of equipment, including precision reduction gears for industrial robots, travel unit for excavators, aircraft flight control actuation systems, brake operating units and door operators for railroad vehicle, engine control systems for marine vessels, and automatic doors for buildings and other structures. Based on these technologies, we will pursue higher energy efficiency in a range of business fields and thereby contribute to reducing greenhouse gas emissions generated through use of the above equipment by our customers.